GEMPACK was first unveiled to the public at a training course, based on the ORANI model, run in 1984 at Melbourne University. At this point GEMPACK would only run on VAX computers -- so there were no Windows programs such as ViewHAR or TABmate. The six previous CGE training courses had used a non-GEMPACK version of ORANI [more history here and here]. CoPS plans to conduct the USA Dynamic CGE course in Washington with the USAGE model, 3-7 June 2019. See details and registration form here. We welcome enquiries to Prof. Peter Dixon. A 1-day Advanced GEMPACK course, 17 June 2019, Warsaw. This course runs on the Monday before the 2019 annual GTAP conference at the University of Warsaw. Details and registration information are available here. A 1-day Melitz-in-GTAP course, 18 June 2019, Warsaw. This course runs on the day before the 2019 annual GTAP conference at the University of Warsaw. Details and registration information are available here. 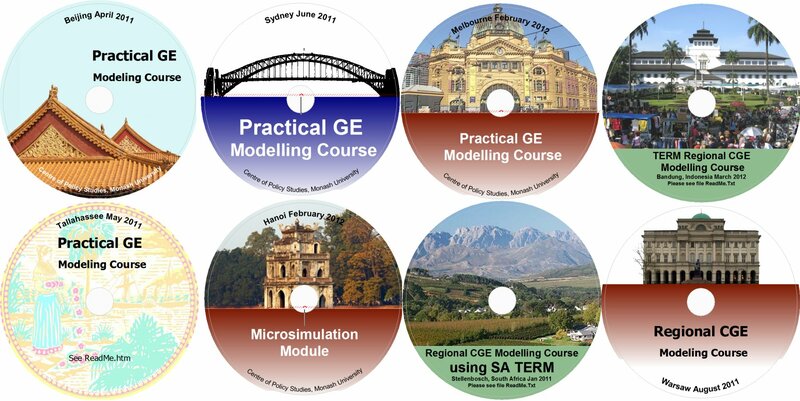 The Introductory Practical GE Modelling Course 15-19 July 2019, at Victoria University, 300 Flinders St, Melbourne [across the street from Flinders St Station]. More details and registration here. A 2-day Advanced GEMPACK course 22-23 July 2019, at Victoria University, 300 Flinders St, Melbourne [across the street from Flinders St Station]. The Introductory Practical GE Modelling Course 9-13 September 2019, at the Austrian Institute of Economic Research (WIFO), VIENNA. More details and registration here, a flyer is also available. More details of previous courses are here, or see previous course photos. CoPS/Impact has been running regular CGE training courses for 35 years. Each course uses a particular CGE model to teach: the basic theory and structure shared by most CGE models, how such models are represented and solved using GEMPACK, and how to interpret and report model results. At least half of the time is given to lab sessions where participants build skills by completing exercises with detailed written instructions and plenty of personal help. There are usually around 5 students per instructor, and at least 2 instructors have 10 or 20 years of CGE experience. Several week-long courses are held each year, either in Australia or overseas, drawing participants from a range of countries and backgrounds (see photos). The CGE courses are of three types: Introductory, Dynamic, or Multi-Regional (see below). Short courses in Advanced GEMPACK use are also regularly offered. The Practical GE Modelling one-week intensive course introduces participants to practical applied general equilibrium (GE) modelling, and to the GEMPACK software used to solve equilibrium models. In particular the course covers the ORANI-G model of the Australian economy. This course should appeal to those needing background in CGE modelling in order to work with, or understand results from a typical single-country CGE model such as ORANI-G and to those wishing to use the theory of ORANI-G with GEMPACK as the basis for a model of a country other than Australia. Read more about the Practical GE Modelling course. We sometimes offer a mini-course on Constructing a CGE database (often just after the Practical GE Course). These courses cover the theory, data, computing and application of policy-relevant dynamic CGE modelling. The courses are built around a dynamic model such as USAGE. These models are used for forecasting and for projecting policy effects as deviations around explicit, realistic baseline forecasts. The emphasis in the dynamic courses is on the underlying economics of the models and the interpretation of results. Nevertheless, participants have considerable opportunity to hone their skills in practical computing using GEMPACK software. The dynamic CGE (USAGE) course was held June 2017 at the USITC offices in Washington DC. The course presents dynamic general equilibrium modelling as a practical tool for forecasting and policy analysis. It covers theory, computation, application and result interpretation. Participants use an aggregated version of the USAGE model of the U.S. economy. USAGE is a 500-sector dynamic model developed by the Centre of Policy Studies (CoPS) in collaboration with the U.S. International Trade Commission (ITC). More details here. A dynamic CGE course with the ChinaGEM model, was held in December 2015 at Beijing. The VURM course (see below) also features a dynamic model. TERM (The Enormous Regional Model) is a multiregional CGE model of a single country, which is "bottom-up" -- it treats each region as a separate economy. Two key features of TERM are: (a) its ability to solve quickly with a large number of regions or sectors, and (b) its database construction methodology, which allows a multiregional database to be constructed quickly, even with quite limited regional data. Regional CGE courses, based on the comparative-static version of the TERM model have been held in Australia, China, South Africa and Poland. TERM-based models exist for 6 or more countries, but most examples used during the course are based on the South African version of TERM. See, eg, here or here. From time to time we also offer a Dynamic TERM course. This week-long course introduces participants to VURM, a detailed multi-regional dynamic CGE model of Australia's six states and two territories. This course was last held in 2015 (photo). Most training courses require that participants bring and use their own laptops, and that they install needed software before travelling to the course. More details here and here. Try the free, introductory-level Minimal course. No additional software is needed. CoPS has conducted many training courses in other parts of Australia or overseas. Such courses are often tailored to particular needs. To find out more about this option, contact Mark Horridge.